Last weekend PAE was on the road, exhibiting at the annual TRPS Concert poster show is San Francisco. Here are some general impressions of the market and the show, in no particular order. 1) The attendance at the show was outstanding. We heard several different dealers remark that the number of visitors was far greater than in years past. This was confirmed by multiple members of TRPS, the organization that runs the show. 2) It was truly a pleasure to have so many of our clients come by and say hello. It’s always great to put a face to a name, particularly when we were able to finally meet people that have dealt with us for many years. 3) There was a distinct and actually glaring, lack of high quality material available for purchase. The few mint condition posters shown were for “display only” and were not for sale at any price. This underscored a major point –if you have the opportunity to acquire mint condition posters, grab it. This material seems to be in the very strong hands of collectors that have no intention of selling, particularly since we are just in the first or second inning of this emphasis on quality. 4) The market for modern posters is alive and well. There can be no denying that Emek, Chuck Sperry, Dave Hunter and other modern masters are perfectly adept at producing irresistible images at affordable price levels. This bringing young collectors into the hobby. It should be only a matter of time before some of these new market participants graduate to the vintage material that is so much more rare and historically important. 5) We had on display our first batch of posters that were independently authenticated and graded by CCG. This is the same organization that has created literally BILLIONS OF DOLLARS OF MARKET VALUE to rare coins, paper money, and comic books. Collectors as a whole were extremely enthusiastic about the concept and the packaging. We received dozens of raves against one negative comment from an old time dealer that didn’t like the idea. This is exciting development has major implications. We will discuss this in detail in future blogs. 6) The show was organized and promoted by The Rock Poster Society. The board members and volunteers working the show were just a delightful group of people that couldn’t have been nicer or worked harder to make sure a great time was enjoyed by all. We will repeat once again, TRPS membership is an essential investment (that’s dirt cheap) if you want to be involved join this field at all. To join, click here. PAE in San Francisco 10/24/15! Every year the Rock Poster Society holds their annual concert poster show in San Francisco. This year, Psychedelic Art Exchange will have a booth where we will buying and selling. If you have posters to sell, please see us LAST, as we will be the highest buyer in attendance. If you are looking for material to buy, see us FIRST as we will have the finest quality posters available in the world today. If you are new to the hobby, please do your best to visit the show, as it will be a great opportunity to view a lot of material and learn what’s going on. Many of the living legends in the business will be in attendance, including 1960’s artists Lee Conklin, Wes Wilson, Victor Moscoso, David Singer, Stanley Mouse and Randy Tuten. Contemporary artists such as Emek and Chuck Sperry will also be at the show. Be sure to stop by our booth and say hello, it’s always great to put faces and names together. We hope to see you there! At the pinnacle of rock and roll collectibles as well , Hendrix memorabilia demands top dollar and sets record level values at auction. His impact on the poster-collecting world is well proven also. 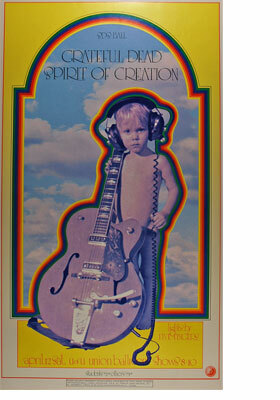 Hendrix posters are some of the most valuable and sought after in the entire genre. 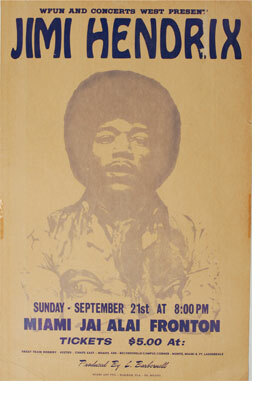 This month we are offering a small, focused selection of Hendrix posters, with the crown jewel being an ultra rare (one of three known) 1969 cardboard Miami Jai Alai poster that is sure to end up in the most advanced collection. So, Enjoy this opportunity to bid on these artifacts, the winning bidders will surely be overjoyed. Hey poster fans. On the heels of one of our most successful sales, PAE continues to illuminate the value and beauty of this world class collectible. During these uncertain economic times, tangible assets such as our beloved posters are finding their place as some of the most stable investments around. Last month, one the most interesting and pivotal characters from the 1960's passed from this plane of existence. Augustus Stanley Owsley III was a true innovator and iconoclast. He will most notably be remembered for his role in the manufacture and distribution LSD in San Francisco the 1960s, however, there was so much more to this character than just supplying acid to the Haight. He was one of the true renaissance men of the psychedelic era. Owsley's early association with the Grateful Dead allowed him to take on several roles with the band. He was their first sound-man, and helped finance the Dead early on. Additionally, he was responsible for recording many early Dead shows, as well as other acts that performed in San Francisco at the time. Owsley was also responsible for designing the Dead's behemoth, yet technically advanced sound system," The Wall of Sound". Owsley will not likely have the acclaim of rock poster artist added to his accomplishments, because only one poster can be attributed to him. 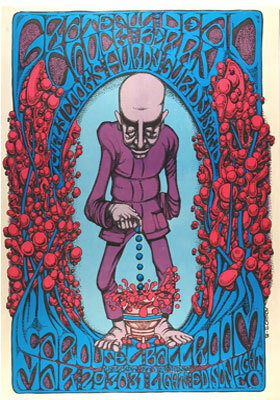 Grateful Dead, Troopers Club, Los Angeles, California, 3/25/66 was the sole concert poster designed by Owsley. 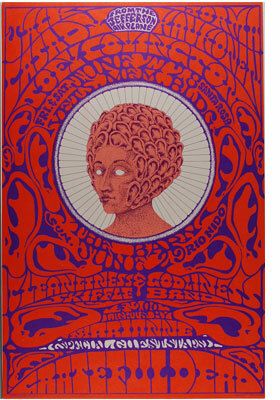 This simple yet "trippy" design is one of the scarcest posters in the entire history of psychedelic concert posters. PAE was fortunate to have acquired one of these historic pieces years ago, and it's signed! We believe the poster to be the best-known example of this poster to exist; it is in amazing undamaged condition. We believed the value of this poster to be $40,000 + before Bear's death...today priceless. The subject of restoration comes up all the time in our conversations with customers. We frequently get asked, does restoration help or hurt the value of a poster? Even though it is our position that we do not offer restored posters, it is still not a simple question to answer. Paper is one of the most fragile materials in the world. It is easily torn, ripped, punctured, and dented. That is why our vintage concert posters are so scarce and valuable in top condition. Let's start with how easily our posters are damaged. These posters are over 40 years old and were not considered fine collectibles at the time. Overall, they were not handled gently at the time of their original use. 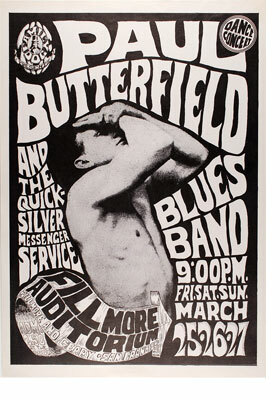 Concert posters were used for advertising purposes, and were taped up in store windows and stapled to telephone polls. Those that were taken down by fans were damaged from the onset. Posters that were handed out at the actual concerts had to make their way back home without getting folded, rolled or bent. Once they got home, they were often damaged by tape, thumb tacks and push pins while being displayed. Not to mention that they were also being decayed by light, heat, moisture, and acidity. Since many of these posters cannot be found in undamaged condition, some collectors began turning to paper restorers decades ago to make their posters more presentable. Is restoration good or bad for the value of a poster? I suppose that is a matter of opinion, however our opinion at PAE is culled from over 65 years of combined experience in the collectibles market. Processes such as de-acidification, pressing, and non-intrusive dirt removal are acceptable in our opinion. These techniques slow the ravages of time, and as long as they do not disturb the integrity of the paper, they are potentially helpful. Additionally, It is our position at PAE, that if the restoration process is completely reversible, as with linen mounting, this type of work is acceptable. The key is that it does not permanently change the original paper. Conversely, anytime you permanently add material or ink to a poster, it diminishes the originality of that poster and should be avoided. In regard to the dollar value of restored posters, we need to look at other established collectibles. In the world of coins, stamps, baseball cards and comic books, restoration significantly devalues the specimen. That is not presently the case in rock posters, however our findings show that restoration does not increase the value of the poster either. A poster with four pinholes may even be slightly higher at this time than those with four filled holes. We do however; strongly believe that looking down the road, restoration will be viewed in a much dimmer light in terms of value. Clearly, if a collector wished to "fix" a poster for eye appeal, and intends to use it primarily as decorative art work to be enjoyed on their walls, that seems completely reasonable. However, if the collector desires to hold it for the future, with the intention of it being sold down the road for increased value, we believe that the piece is better left alone. PAE Promotes Record Setting Concert in Park City, Utah! It is well known among music aficionados that the venerable New Orleans jamband, The Radiators, have announced their retirement after 33 years of touring with the same original lineup. Psychedelic Art Exchange was pleased to promote their final show in the State of Utah on Valentine's Day, February 14, 2011 at the World Famous Harry O's Nightclub. Psychedelic Art Exchange, since its inception, has been very active in the Park City, Utah and Baltimore, Maryland communities. We believe in giving back to the music community, the people that have made PAE such a resounding success. The show featured a stellar performance by "The Rads", and more tickets were pre-sold for the event than ANY show EVER at Harry O's. Several clients and friends of PAE flew in for the event, a wonderful reception and poster viewing preceded the concert, and a wonderful time was enjoyed by all. PAE looks forward to sharing more happy times with all of its fans, clients and supporters around the world. Music Memorabilia Investment Goes Mainstream! It's no secret that we live in interesting financial times. We are just now emerging from the largest financial collapse of the past 70 years. 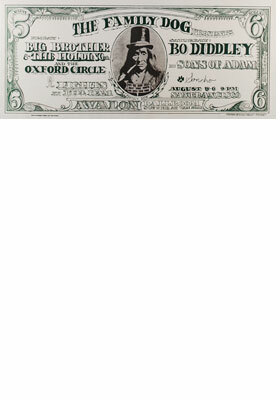 In order to facilitate the recovery, The United States is printing paper money at truly historic levels. This has led to a precipitous drop in the value of the Dollar. Investors here and abroad are scared of seeing the hard earned savings devastated by this monetary inflation. There is now renewed focus on all tangible, "hard assets." The result is record high prices for Gold and Silver, as well as extremely strong markets for collectibles such as rare coins, stamps, art, and yes concert posters. All you need to do is review the prices realized in our most recent auction for verification of this fact. Please look at the attached high profile article that appeared on CNN. Note that high-grade guitars bring $1,000,000 while the most fantastic, rarest posters of all are still in the $10,000-$25,000 range, with dozens of super rarities worth well BELOW $10,000!! We never believe you should buy for investment purposes only. It's the true collector that seems to ALWAYS make out like a bandit in the end. See previous posts for why. But the fact remains there ARE people doing this and that means prices are headed much higher. We agree with the attached article that its important to understand the GUARANTEES that come with the memorabilia you acquire and PAE offers the strongest guarantee available anywhere. If you want to build a world class collection of vintage concert posters, now is clearly the time to do it! Our current auction features several high quality offerings from 1966, the year that pretty much kicked off what has come to be referred to as psychedelic sixties. San Francisco was historically a home for misfits, and dreamers, so table was set for something big. LSD was legal, and becoming available and the bohemian youth of the Bay Area were the first to sow their seeds in that fertile ground. The experimentation, and innovation in arts and culture that grew out of those phenomena cannot be understated. These nearly pristine pieces of art from 1966 represent some of the finest known examples available anywhere from that pivotal year. This was "the" beginning of the poster scene. 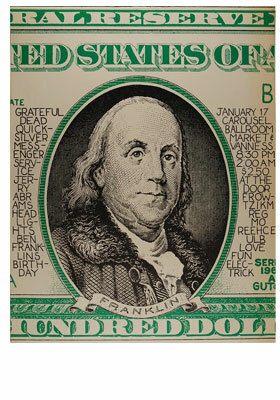 Concert Posters were not considered collectible in 1966. Like most other pop culture collectibles, they were produced for an intended use. They were not to be stashed away for future profit. Most of them were used solely for advertising, then scooped up by fans as souvenirs, or to decorate their rooms. They were pinned up, taped up, glued up, and as a result very few remain in decent condition. Only after the promoters realized that there was an aftermarket for this artwork, did they begin to roll off larger quantities and reprint the more popular designs. The fact that this material is now 45 years old is not to be underestimated. The passage of time has allowed these posters to be appreciated for what they truly are. Important artifacts from a pivotal time in America's cultural evolution. As with any true collectible, the passage of time adds considerably to their value as well. When I started collecting these posters in 1983 they were roughly 17 years old and I was able to obtain them for a ridiculously low cost . In today's view that would be like collecting posters from 1994. Just to give a historic perspective, 1994 was the year Kurt Cobain took his life. Those 28 years have caused these work to "ripe" significantly. 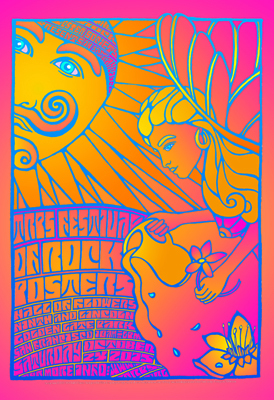 All this just further illustrates that we are on the cusp of the Psychedelic Concert Poster being realized for its proper historical importance. This will surely result in these beautiful works of art finally earning the attention, and value that they truly deserve. The Psychedelic Art Exchange celebrated the Grand opening of our new gallery space late last year to an overwhelming response. It was a great joy to introduce our friends, fans, and curious onlookers to our new gallery space. Many in attendance were previously unaware of the existence of 1960's concert posters. Those uninitiated eyes had the same response that most everyone does when they view this beautiful artwork for the first time. Wow! When we took lease of our space at 3846 Falls Road in Hampden, we envisioned the space purely as office. However the highly visible street access and the high ceilings, not to mention being in one of Baltimore's most interesting neighborhoods compelled us create a full concert poster gallery. The space took shape better than we thought and transformed magically from work space to gallery space. PAE has always believed that one must see this amazing artwork up close to truly appreciate its magnificence, and this was the perfect opportunity to test that belief. With art so detailed and colorful, viewing images of the posters in print or on a computer monitor, just doesn't do them justice. The event was an unqualified success. Guests took in these artifacts of the psychedelic era with delight, as they enjoyed the offerings of food and drink. The crowd was even more eager to drink in knowledge of our collective passion. Attendees poured over the resource volumes and other printed material with great interest. In fact the books got as much attention as the hanging works. This response further encouraged us at PAE to continue to spread the word about this world class collectible. Being so immersed in the world of the psychedelic concert poster we are often surprised by how relatively unknown this incredible body of work is to the world at large, even those who are longtime veterans of the live music scene. Thanks are due to those who supported us in our inaugural event. Molly McNulty, Jen Devos and Chef Kevin Miller. Thanks for making us look good. This summer has been a very busy time here at Psychedelic Art Exchange. We have greeted several new big money players that have recently entered the market, smitten with the history, beauty and value that these beautiful artifacts represent. These new collectors have no problem paying that extra 20%-30% to get the material they like..in the condition they want. We have handled many 4 and 5 figure rarities including a couple of pieces not previously known to exist! These pieces are now ensconced in long term collections that will be off the market for decades to come. If you have holdings of Premium Quality material, be sure to call us LAST so that we can prove we are the nation's high buyer. Our clientele is very deep pocketed and we represent the most sophisticated collectors in the world today. If you are an active collector of Premium Quality material, we urge you to contact us with your "Want List" as the huge majority of the material we sell is never offered on a public basis--our backlog of orders simply prevents that. We have just been notified of a MAJOR DEVELOPMENT that is sure to send this market in thermo nuclear overdrive as soon as the news becomes public. We will have more details of this exciting, breaking news in the coming weeks! As a collector, you have a tremendous advantage over every dealer you may be doing business with. Yes, you read that right, you, the collector, have the advantage! Long term this could prove to be a huge mistake. 1) There is no telling when a similar piece will enter the market. If it's another three years, this could easily be a $5000 poster, but the dealer misses out because of $100. 2) The dealer is not taking into account that Mint Material has migrated into very strong and sophisticated hands which greatly increases the cost when the next piece does appear. 3) The dealer fails to recognize that the popularity and appeal of the material is now going mainstream into major museums around the world, 4) The dealer fails to recognize that the appreciation and rarity of Mint material is exploding upward, with premiums jumping to levels similar to what is found in other collectibles. I could go on and on. The bottom line is that the dealer was so "smart" about knowing what the piece was worth from past facts, that he could not ascertain the true value of the piece moving forward! That's just dumb! We see this in the financial markets as well. Mutual Fund managers will regularly pass on undervalued companies with great 3-5 year possibilities because they don't see a catalyst that will move the stock in the next quarter! As a collector, you need to use this superior position and long term outlook to your advantage. Recognize opportunities for what they are. Don't penny wise and pound foolish. Most times, paying that extra 25% now will be a whole lot cheaper than what you'll pay 3 years down the road when the opportunity presents itself again. Let time and positive fundamentals work for you..not against you. Be long term greedy. You'll look like a genius and will have a lot more fun with you collection if you have the strength to play out your hand! The wonderful Grateful Dead exhibit at The New York Historical Society gets national news treatment from NBC! In the recent Heritage magazine, there is an article about the recent price performance of movie posters and how they have come into their own. The article references the fact that before 1990 the most valuable movie posters were worth $10,000 and now they are worth $500,000! The reason? They are pieces of history that are beautiful and rare! Sound familiar? The current Pinnacle Collection sale offers the collectibles world unprecedented access to some of the most desirable concert posters ever offered at public auction. In fact, this sale represents the finest quality sale of its kind--EVER!!! These posters are sure to be placed into long term collections, and it could be decades before this high quality of a collection is offered again. Don't let the opportunity pass. The following is an excerpt from the article; "The research, originally compiled for Heritage auctions and updated and expanded by Halperin and Cantu, helps explain why a poster for the 1932 film Freaks increased in value from $10 to $107,550 in 30 years (it's the only one of its kind), why we may never see the 1927 Lon Chaney film London After Midnight (all prints have been lost), and why Flying Down to Rio posters are highly prized by collectors (the musical marks the debut of Fred Astaire and Ginger rogers as a dancing team). Vintage movie posters as a collectibles category have boomed in the past 20 years, says Grey Smith, director of vintage movie posters at Heritage auctions. "before 1990," he says, "the most valuable posters were under $10,000. Today, top prices are rapidly approaching $500,000." The Famous Pinnacle Collection! 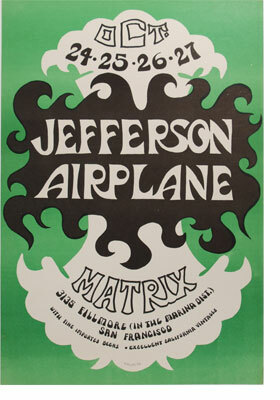 The Finest 1960's Concert Poster Auction Ever! We are proud to offer you a collectibles event that has been over 25 years in the making! The Pinnacle Collection contains the finest accumulation of MINT early 1960's concert posters ever offered at public auction. Each and every poster was hand selected for its unsurpassed quality and eye appeal with no compromises allowed or included! Many of the posters offered here are being offered for the FIRST TIME IN DECADES. Please carefully consider the unique opportunity at hand as it will surely be many years--if ever--that a sale of this caliber takes place again. Students of the collectibles markets understand that it is sales like this that sow the seeds of future great collections--will one of them be yours? All great collections are ultimately built on the back of previous collectors that for one reason or another choose to liquidate their holdings. This happens infrequently, and when it does, you can throw the price guides and previous sales data out the window as seasoned collectors circle like sharks for the juiciest meat of the sale. The highlights here are too numerous to mention. Each and every piece is an Original First Printing unless otherwise noted. All posters have been PAE Authenticated and Graded and are backed by the strongest guarantees available anywhere. Make no mistake about it, collectors will need to "stretch" to claim a prize in this sale. Our best advice is to remember that quality is remembered LONG after price is forgotten. The question that needs to be asked is whether you will care 10 or 15 years from now that you paid some reasonable premium to secure a rarity today? We think not! We hope that each and every one of you enjoy viewing and bidding on this sale as much as we enjoyed cataloging it. Psychedelic Art Exchange prides itself on offering unsurpassed quality and service and we believe this historic event clearly delivers on this goal. Today's news brings word that the world record price for a comic book has been smashed yet again, this time an Action Comics #1, featuring the first ever appearance of Superman, brought $1,500,000! A similar comic brought $1,000,000 in February, but this example brought $500,000 more because it was in BETTER CONDITION. Now, I'm sure the person who sold this book is quite pleased that they paid "whatever it takes" some years back as this premium translated to a $500,000 premium on the back end. The auctioneer who handled the sale is quoted as saying "The book looks like it came off the presses yesterday. It's a stunning copy, it almost looks brand new." This is just another example of what we've been instructing our clientele to do. If you get the opportunity to buy a finest known poster for $12,000 that everyone else thinks is "worth $8500", you are one lucky collector. That $3500 premium now puts you in the catbird seat and allows you to ask whatever you wish down the road. I bought 6 coins for an "extra premium" of about $200,000 total, and today those coins are worth an extra 6 or 7 MILLION dollars. That's the way the collectibles market works. Always has worked that way, always will. Some people understand the concept right away, some never at all. You need to figure out which group you are in. Also, this recent news further reiterates why we believe that museum quality Mint Condition posters are stupid cheap. The finest known examples of the most famous issues are still priced for a song. This situation is changing as you read this, act quickly before the window of opportunity slams shut forever. http://www.cnn.com/2010/SHOWBIZ/03/30/superman.comic/Also, if you enjoy these commentaries, please click on the title of this post and leave a comment! Most of the advice given out on this blog is pretty simple to follow and not hard to understand. Practicing the rules of successful collecting is, for the most part, really straightforward, easy to understand and is simply grounded in common sense. Now I want to share with you a tip that almost NOBODY practices, will be hard for you to force yourself to follow and will bring you benefits beyond your wildest imagination! The tip is, BUY THE KEYS FIRST!! What this means is this: Let's say you decide to put together a set comprised of 30 posters. Let's say that 25 of these posters are going to cost you $1000 each, 4 of the posters are going to cost you $5,000 each. And the rarest item in the set is going to cost you $10,000. My advice would be to invest $30,000 in the five keys of the set instead of spending the very same money on the 25 more common issues! Most people would begin this set by acquiring the cheapest posters first. This will happen for two reasons. First, the cheaper items in the set are going to be the most common and readily available for purchase AND the collector, armed with a new project can quickly make a major dent in his/her "want list". Of course, the fact that these items are also the most affordable also makes each purchase decision easier to swallow and "less painful". But here is where reality defers from how everything "looks on paper". Many collectors, after spending a year or two and $25,000 on the more common issues will either run out of money, or enthusiasm. And, during the previous two years, the 5 keys that were worth $30,000 are now going to cost you close to $40,000! For the very same investment, the collector could have had the ENTIRE SET OF KEYS, the posters that everyone wants but no one has, and had a collection that would be highly coveted and increasingly more desirable with each passing year. The collector could then, at a leisurely pace, fill in the holes of the more common issues as the opportunity presents itself. And because the collector with the keys now owns a world class grouping that brings much pride and joy, he/she is MUCH more likely to stick with the hobby and enjoy all of the opportunities that exist by participating for the long haul. This is a hard strategy to follow, especially for someone just starting out. But if you talk to any seasoned collector who has been around the block a few times, they will all have war stories of having been offered a key that they passed on, only to snap it up later at a far higher price. Some advanced collectors have even modified this strategy to "Buy Only The Keys". They would rather exclusively collect only the finest and rarest, preferring to "keep their powder dry" for just "the best of the best". No matter how far you take it, stick with the number one rule of collecting..Buy the Highest Condition and Rarity that you can afford and you will be richly rewarded in this exciting marketplace! We're glad to be back posting this blog. Whenever you see a pause in our postings you can be certain the reason is we're too busy to post, as there is never a shortage of news to report on here at Psychedelic Art Exchange! In the coming couple of weeks we will have a MAJOR ANNOUNCEMENT that is sure to be of interest to all collectors of Classic 1960's Psychedelic Rock Concert Posters. This new project has been directly responsible for the dearth of correspondence in recent weeks. Check back here often in the coming days as we will be working hard to "play catch up" and will be putting up frequent posts to bring everyone up to date on this fast evolving market! First off, about three weeks ago, I had the pleasure of spending some time with poster collector extraordinaire, Mr. Joe Armstrong. Joe is universally recognized as one of the most knowledgeable poster collectors in the world. Joe began collecting for fun during his college days in the Sixties, and has been a major force in the marketplace since the early Nineties. Joe's collection has to rank, without a doubt, as one of the very finest in the world. Besides extensive expertise, Joe is a genuinely nice guy who is never too busy to answer questions or impart advise. I highly recommend you visit his site, www.vintageconcertposters.com. Joe and I met on the slopes here at Park City where we ripped it up going down the mountain and had a chance to discuss all things "Psychedelic" on the chair lifts up! Joe agreed that there are two major trends happening in the marketplace right now. First, prices are continuing to steadily rise. When following the collectibles market, price information is harder to come by. Unlike stocks and commodities, you can't get an hourly or daily price quote. This means that on the surface, it may appear that nothing is happening, but when you realize as Joe pointed out that Mint Condition FD26's (now $15000-20,000) used to trade for $1000-$1500 in the early nineties, the long term price performance of the best pieces in the best condition is simply staggering. Secondly, Joe reiterated that he sees a definite shift of focus among collectors. Collectors are aggressively seeking out the few remaining posters that have somehow survived in Mint Condition. Collectors are willing to pay "whatever it takes" for the best quality material while posters with pinholes and other signs of damage that sold quickly in years past are now becoming more difficult to unload. At Psychedelic Art Exchange we saw this trend coming from miles away and have always advised our clients to acquire the finest quality pieces they could locate and afford. There will always be a market for the cream of the crop, while run of the mill will always and forever elicit yawns. The choice is yours, but always remember, the Trend is Your Friend! Through this blog we try to impart advice that has been hard earned through over 50 years of combined experience wheeling and dealing in the collectibles markets. There are certain "rules to live by" that are necessary for success no matter what collectible one is addressing. Today I'd like to share another one of these "golden rules" with you. There is one number in collectibles that is instantly more sought after and valuable than any other number and that is the number ONE. ONE as in FIRST!! The first corvette, the first Batman comic, the first U.S. coin are all immediately recognizable due to the HISTORIC IMPORTANCE of the collectible in question. Anybody and everybody can understand THE FIRST, and therefore THE FIRST of everything has an intrinsic desirability to people inside AND outside a collectible market. So how does this pertain to Classic 1960's Psychedelic Rock Concert Posters? Well the BG1 and the FD1 and the first posters at any other venue have always enjoyed top demand. But so is the FIRST appearance of a given band at a venue, or THE FIRST poster designed by an artist, or THE FIRST year of a band's existence. There are lots of FIRSTS that one can collect--but be certain of one thing--there will always be more people that want to own these items than there is supply to go around. So it's up to you to use this knowledge to your advantage. You won't be the FIRST to profit from it and you certainly won't be the last!! The market for Mint Condition Psychedelic Rock Concert Posters is now receiving unprecedented attention. This appreciation is leading to record levels of demand from two distinct groups of individuals. Experienced, seasoned collectors widely recognize that their long term interest and dedication to the hobby is now finally being validated by the mainstream society and media. New participants to the field are rapidly and aggressively migrating to the genre from other collectible areas due to their belief that these beautiful works of art represent the most compelling value proposition in the world of collectibles today. All of this has led to a DRASTIC supply/demand imbalance that is resolving itself through gradually higher values. Psychedelic Art Exchange has far more demand than we can meet through our tiny available supply of Mint Condition pieces. We are spending hours each day speaking with our contacts around the world and every poster we shake loose is a MAJOR effort. If you have premium quality pieces that you would like to sell, please contact us immediately! We can offer you two different ways to turn your material into cash--through outright purchase or through auction consignment. Each method has distinct advantages and we would be pleased to discuss those with you at your earliest convenience. Either way, Psychedelic Art Exchange can GUARANTEE you the absolute highest prices available anywhere in the world today as we represent the most sophisticated collector base for this material. Our clients fully understand the special opportunity that these posters represent and are all too happy to pay a premium price at today's levels in order to nail down the best quality pieces. To sell your posters, please call Glen Trosch, President of Psychedelic Art Exchange, at 410-464-6180.